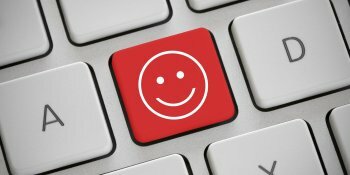 Smile, and start to build an excellent online rapport with your colleagues. You instinctively know when you feel a rapport with a colleague, client or customer after meeting him or her face-to-face. You just "click," and have a sense that you share the same goals and values. and mutual understanding between people, and can open doors to new opportunities. , how can you and your co-workers develop it if you're never in the same room? Well, now the good news – building rapport online is a skill that you can learn! In fact, you've probably already done it with your Facebook® friends and LinkedIn® contacts without really knowing. So, here are five tips for developing mutually rewarding working relationships with people you'll never meet. Dilts, R. B. (2003). 'From Coach To Awakener,' Soquel: Meta Publications. The following are trademarks: Facebook (see www.facebook.com), Google (see www.google.com), LinkedIn (see www.linkedin.com), Microsoft (see www.microsoft.com), Skype (see www.skype.com), and FaceTime. (see www.apple.com).